Introduction, Index and editing by J.B. Bury. Notes from Edward Gibbon. An additional Letter to the Reader from Philip Guedalla and a Note on Piranesi from Paul McPharlin is also included. 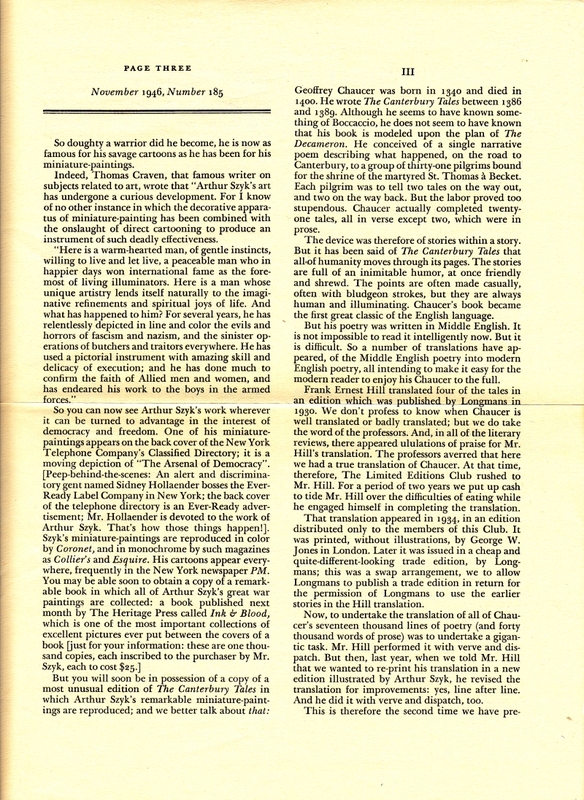 Reprint of LEC #174, 16th Series, V. 12, in 1946 in 7 volumes. Front Binding – Well, it’s been a long time coming, but we’re finally tackling some of those multi-volume works I’ve had lurking within my collection for the month of December. 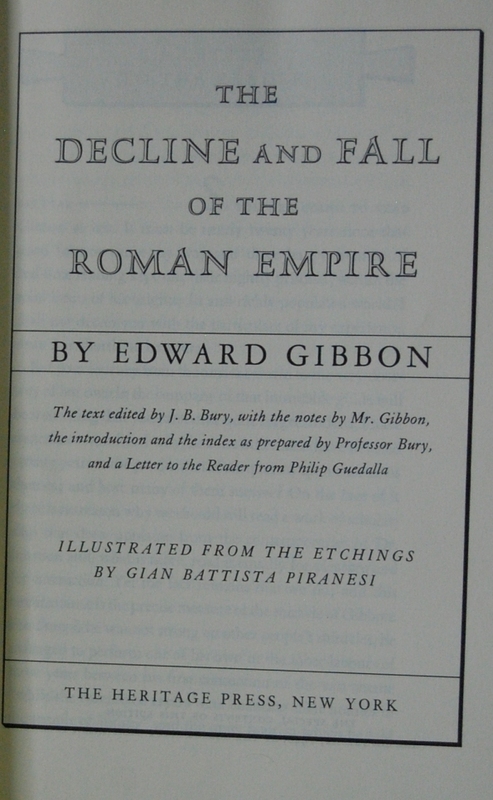 To kick things off, we’re reviewing the famous history The Decline and Fall of the Roman Empire by Edward Gibbon, issued as a three volume set by the Heritage Press. 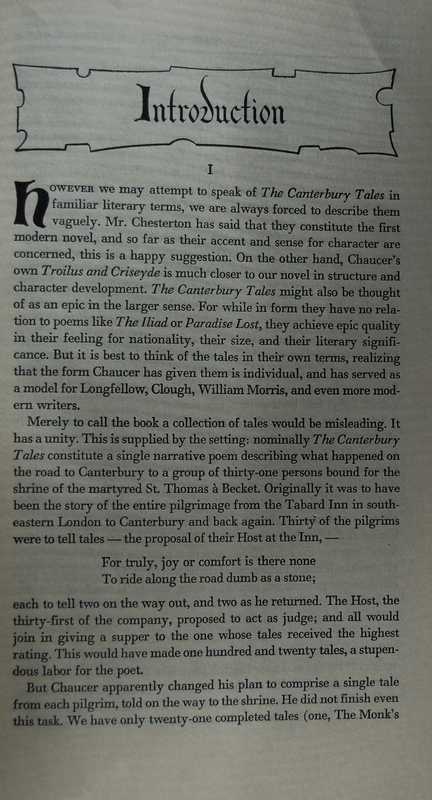 The LEC broke the text up into seven books, making it perhaps more readable. Regardless, this is a treat to the eyes. 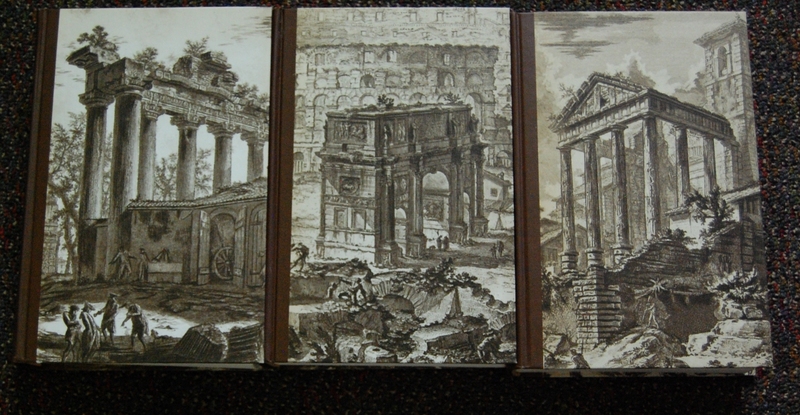 Gibbon’s text is accompanied by the reprinted etchings of one Gian Battista Piranesi, and together you have fifty years of Rome research (twenty for Gibbon’s text; thirty for Piranesi’s artwork) neatly compiled into one convenient set. 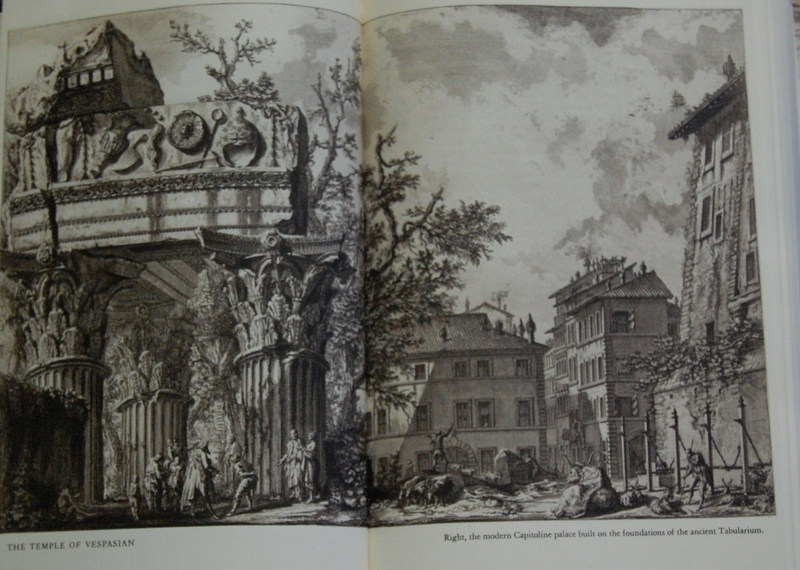 Gibbon nor Piranesi would see another Macy commission, which is understandable. The two were primarily known for their respective works of Rome, and with this issuing, I presume there wasn’t any need to utilize either again. 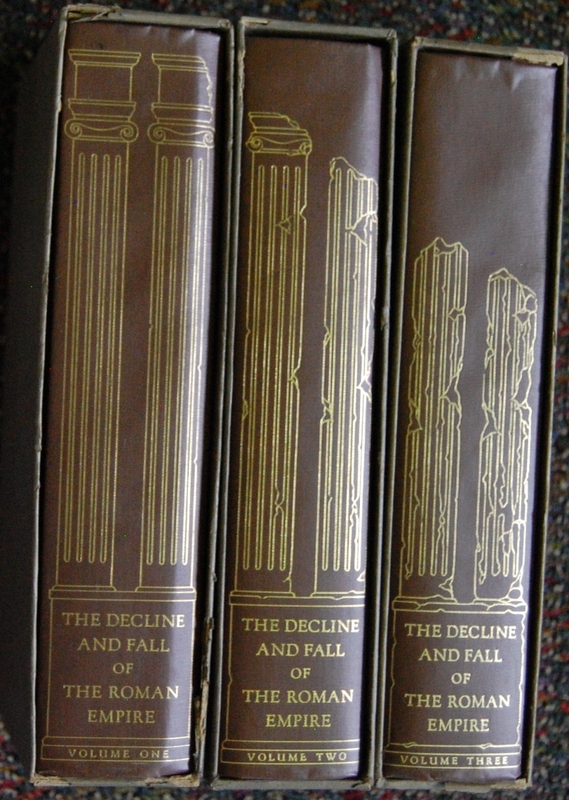 I do like this set, though — the covers are quite classy, and the spine design of crumbling pillars is among the greatest the Heritage Press put out (the LEC used a similar motif, but I think I prefer the HP version of it more). Just a lovely set altogether. To say that he’s quite the interesting character is an understatement! There’s a book about him in which the LEC Decline & Fall is afforded merely a single sentence (and yet there are pages after pages about all the other books & design work that he did). Without going to the University of New Mexico or accessing his correspondence, the best guess I can venture as to about when this project was begun is all due to circumstantial evidence. He was a member of the Typophiles organization. 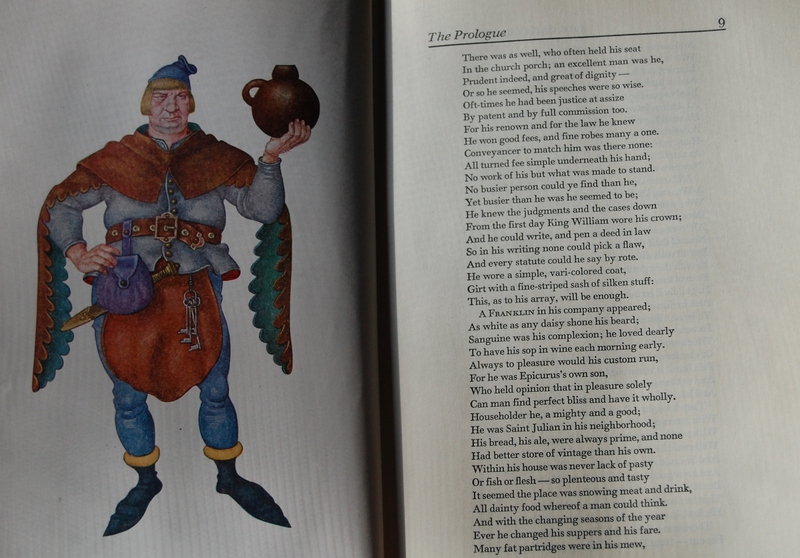 He designed and illustrated several books – especially for the Peter Pauper Press. He was drafted in July of 1942, and while in the Army did several “literary” things, including starting a newspaper and such (far too many to list). 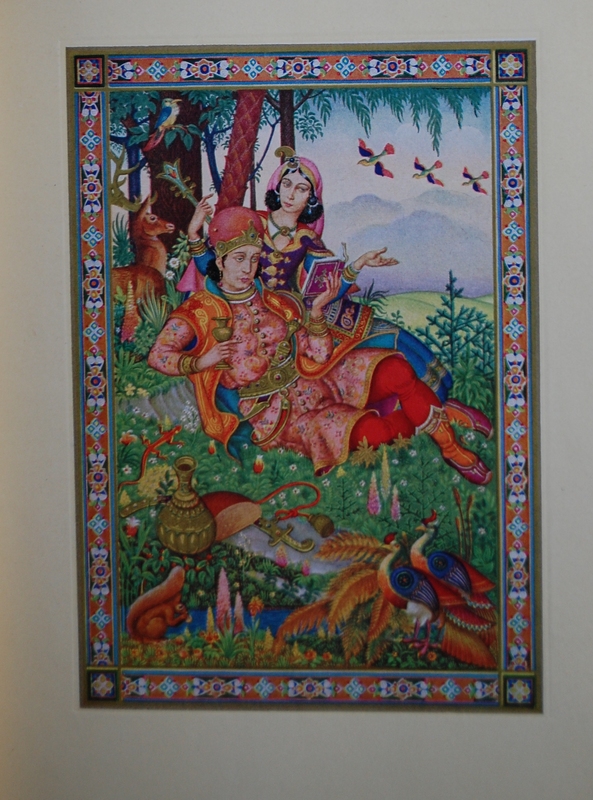 The Howard book goes on to mention that McPharlin was able to complete several side projects while overseas and that the publication history of several books (mostly Peter Pauper Press books) do not mention or reflect when McPharlin’s work was complete or begun, such as the Peter Pauper’s Rubaiyat of Omar Khayyam. the McPharlin edition. It has no copyright date, and everywhere I look for it – it’s dated as “ca 1940s”. 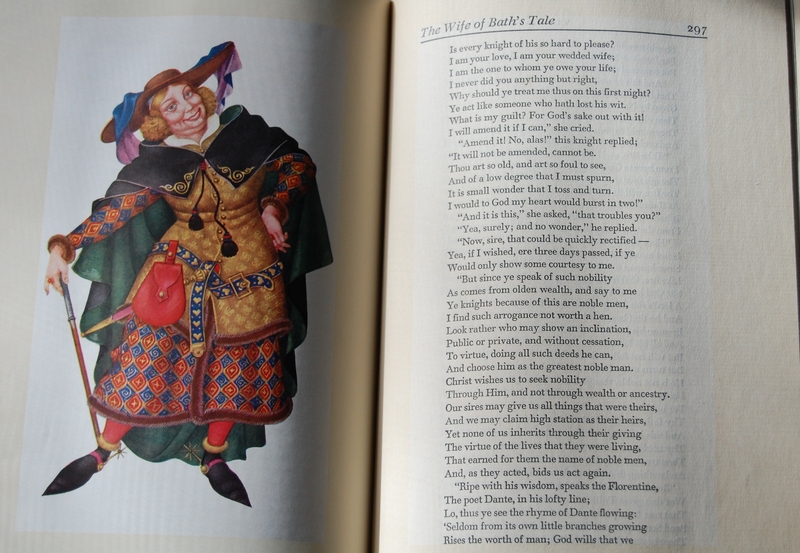 There is an edition printed in 1949 using Vera Bock’s illustrations. The Howard book mentions that McPharlin completed his illustrations for this edition in 1942 but that it wasn’t printed in 1942, and it was implied that it was printed at least a couple of years later. Due to his reputation as a puppetmaster, I strongly suspect this is why he got involved with George Macy for the 1937 Punch & Judy LEC edition (he wrote the introduction and edited the book). Apparently he kept up a correspondence with Macy that lasted years, but had a stronger relationship with Peter Beilenson of Peter Pauper Press. McPharlin’s New York years (1944-1948) were when he did most of the book work in his life (note that this isn’t “all”, just where the greatest volume was). I strongly suspect that McPharlin was able to acquire the folio of prints in Italy somehow during his service, or in 1945 during the few months between the war’s end and the Monthly’s Letter’s date (assuming that the 1945 date is not a typo). Yet, either way – this is still superhuman to me. Designing and completing the whole set within a year or starting the layout process during wartime is still an impressive achievement. 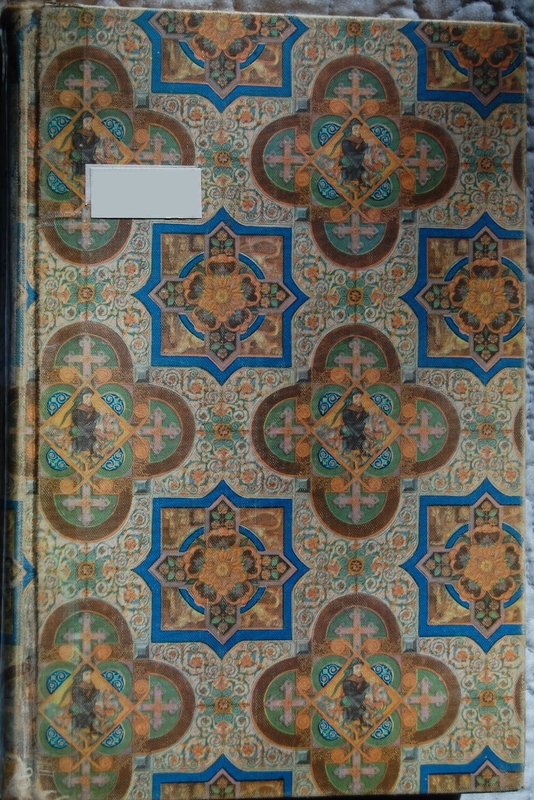 He also got the Piransei portfolios utilized for this book’s illustrations, composed the headings (both in terms of their design and their selection; McPharlin used Gibbon’s own notes to comprise the chapter titles), supervised the creation of the endpaper maps (executed by William Meek), and chose the individual etchings for reproduction. Passionate fellow! 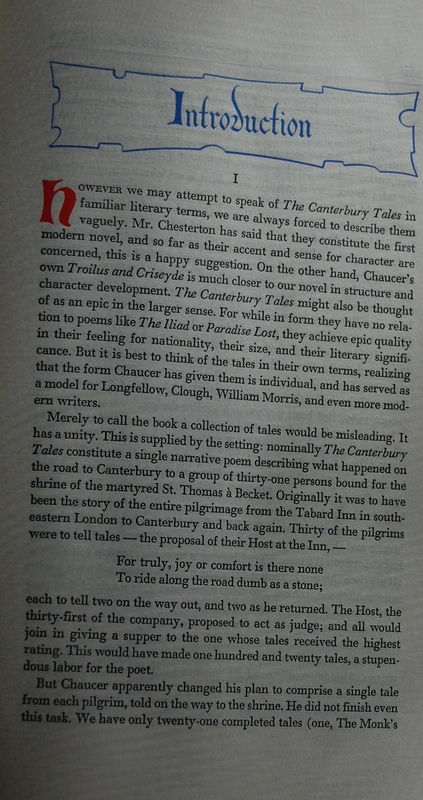 As for the book itself, McPharlin chose Granjon as his primary font, with the notes in Granjon Italic. Chapter numbers are in Bodoni. Dr. F.W. 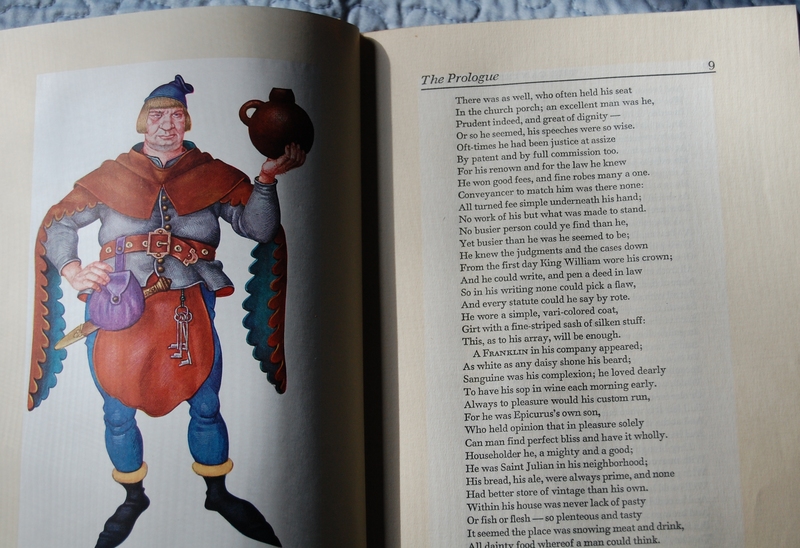 Robinson translated Piransei’s titles and captions for the illustrations. The etchings were reproduced by the Photogravure and Color Company of New York. 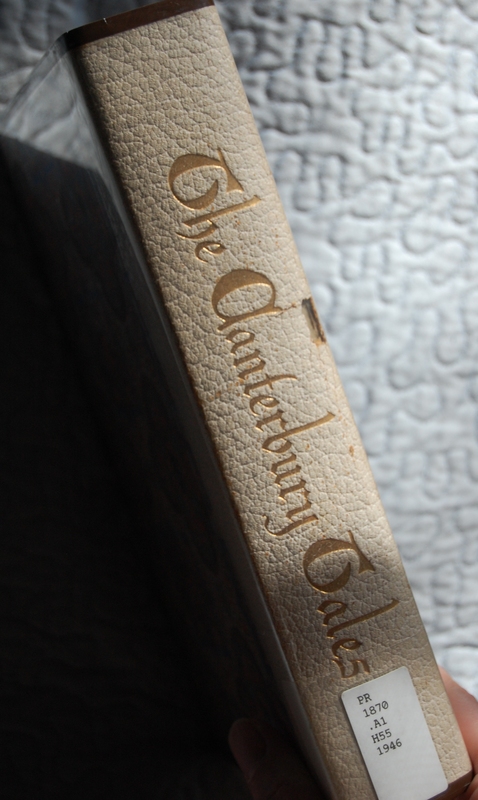 The chapter initials were reproduced from the Nonesuch Press edition of Don Quixote. 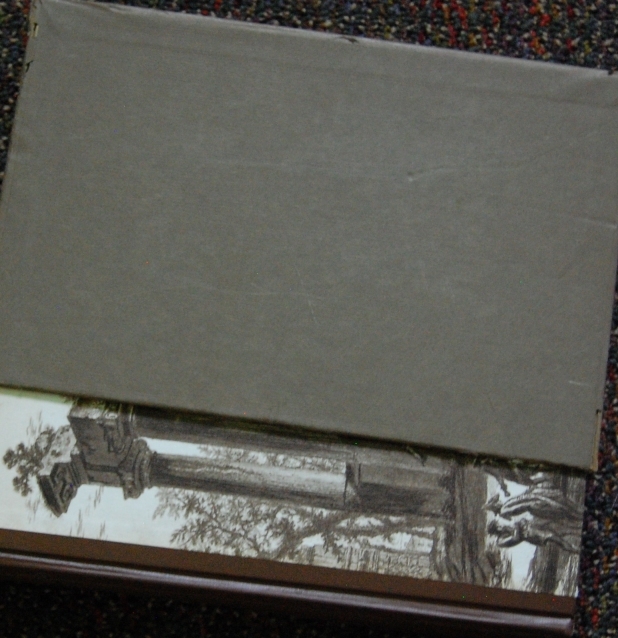 The Quinn & Boden Company printed and bound this edition, and the paper was supplied by the Chillicothe Paper Company. Macy notes that “three-quarters of a million sheets were required — some 275,000 pounds of paper — an entire trainload!” The spine’s Ionic columns were designed by Clarence P. Hornung. And that’s not even mentioning the text’s intro writers! Macy commented that this was, at the time, “the most herculean labor of our career.” Luckily, the effort paid off in an amazing collection of books! 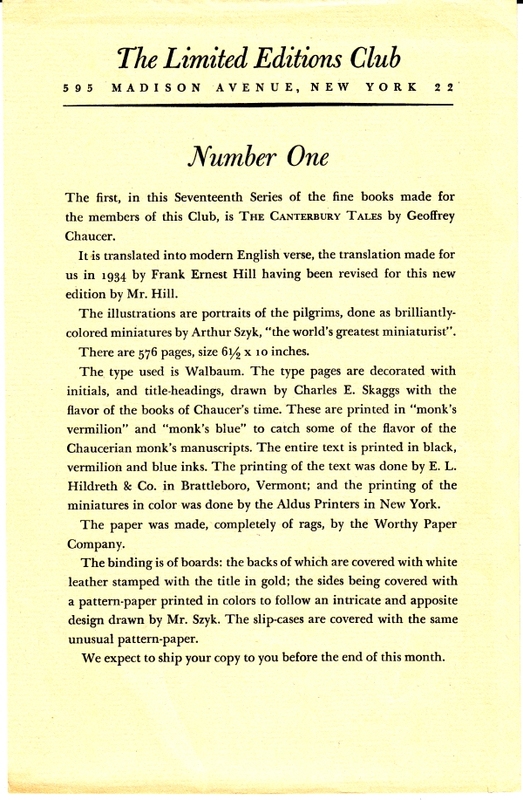 Title Page – This may very well be one of the more diversified releases of the George Macy Company in terms of writing, as well. 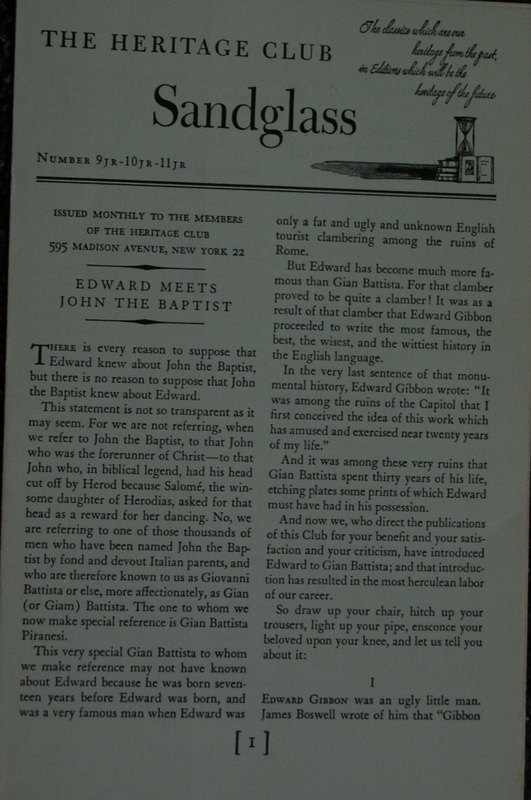 Three separate introductory texts precede Gibbon’s: the initial intro from editor J.B. 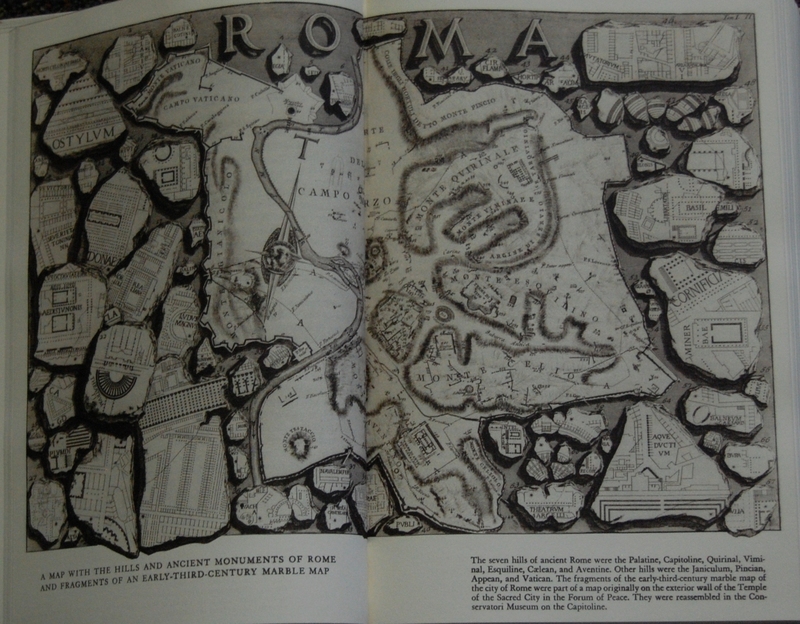 Bury (who also indexed the book), a “Letter to the Reader” from Philip Guedalla, and a “Note on Piranesi” supplied by McPharlin (who sadly is uncredited on the title page). 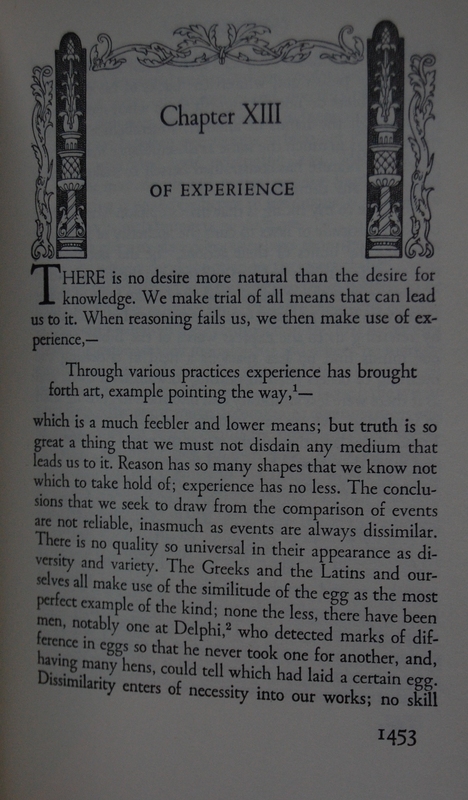 Page xlviii (text) – Each illustration features a little introduction like this one. 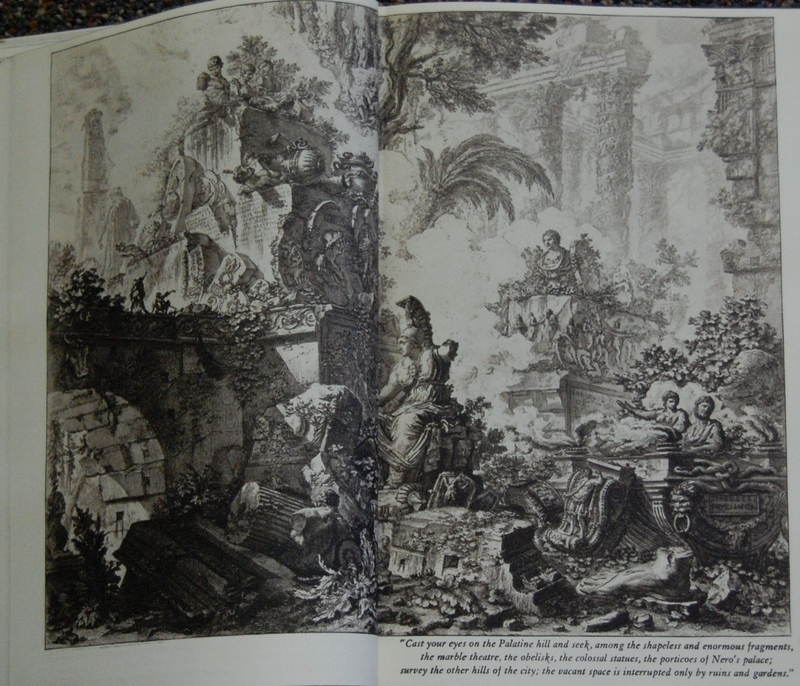 Page xlviii (illustration) – Piranesi’s etchings are quite lovely, and all take up two page spreads in the three volumes. Mine has a brownish tinge to them that the camera did not really bring out, alas. Page 24 – Maps also pop up on occassion. Personal Notes – Gibbon’s work has intrigued me on an intellectual level for some time, so I knew I wanted at minimum the Heritage edition to read someday. This set, which is mostly in good shape save some taxing to the spine (given the mammoth size of each tome, I’m not surprised), came to me through my 50 book purchase from the Oakhurst Library. The LEC set is nice, too, but I think in some ways I prefer the Heritage run. However, I wouldn’t turn down the LEC if I found it at a steal of a price! 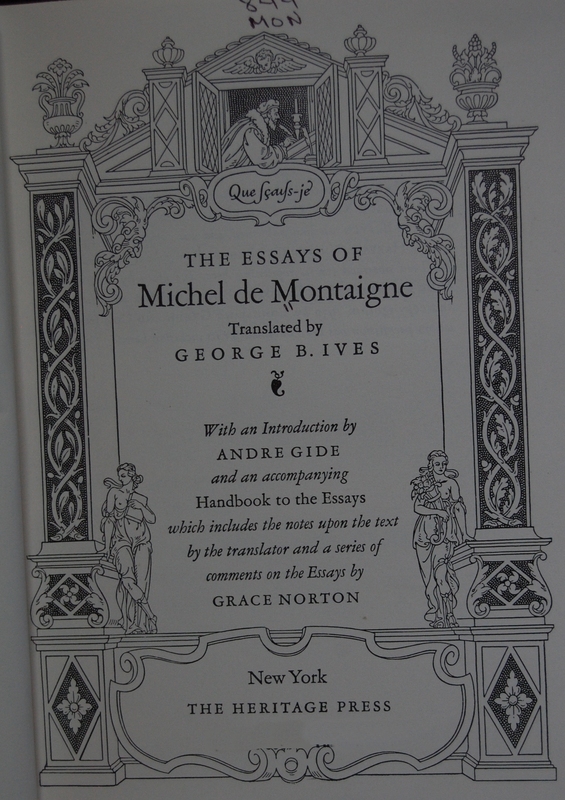 Front Binding – Michel de Montaigne is one of the legends of the literary essay, helping pioneer the concept of Skepticism and pretty much creating the definition of the essay as a major form of writing. He has inspired numerous authors over the centuries, and his ideas continue to influence us today. He was a Frenchman of noble blood, and was viewed more or less as a statesman who liked to write more than a serious author in his own time – his style, which included autobiographical anecdotes along with more philosophical inquires, was not en vogue in the mid to late 1500’s when he lived, and his work has a fairly modern feel to it that makes him easier to understand than some of his contemporaries. 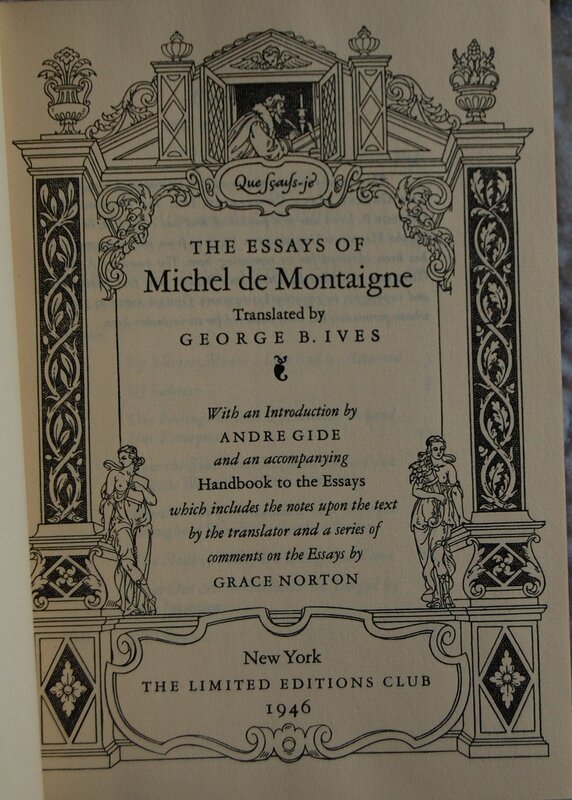 In 1946 the Limited Editions Club decided to publish the Essays in a lovely four volume set, three containing Montaigne’s work and a fourth with notes on the work from the translator, George B. Ives, and additional comments from Grace Norton. T.M. 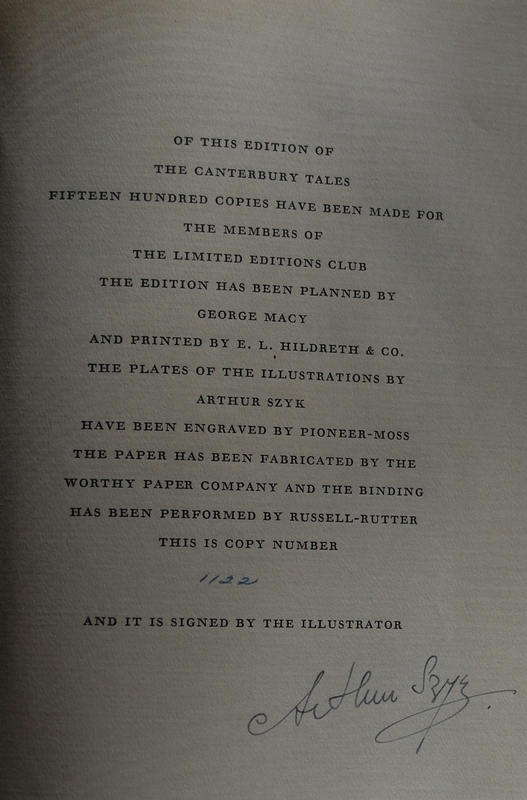 Cleland served as both designer and illustrator for the work, and he attached his signature to the LEC edition. For those wishing to know more about him, I have detailed out Cleland’s career with the Macy’s here. 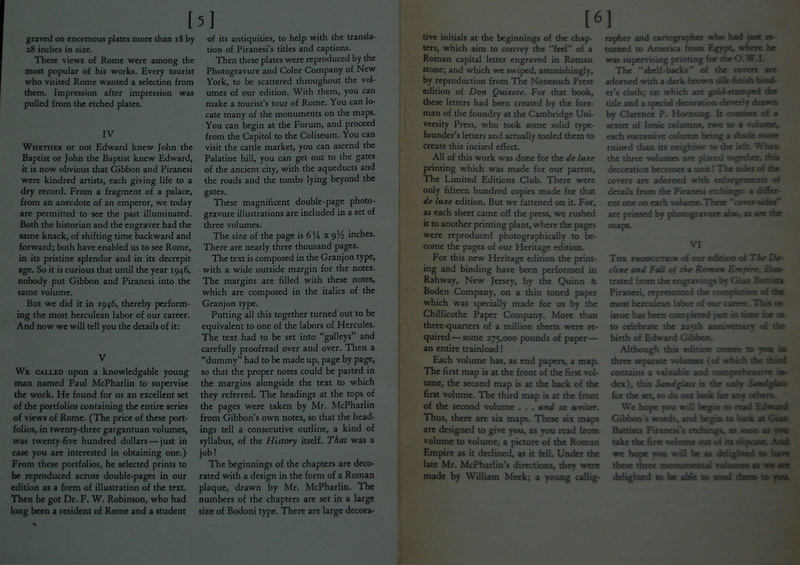 When the Heritage Press did their edition, they condensed the books down to three, splitting Volume 2 into two parts and keeping the notes as a separate work. Regarding the LEC, I checked out two, the first and the Handbook, for the purpose of this blog. All four have the same binding style. 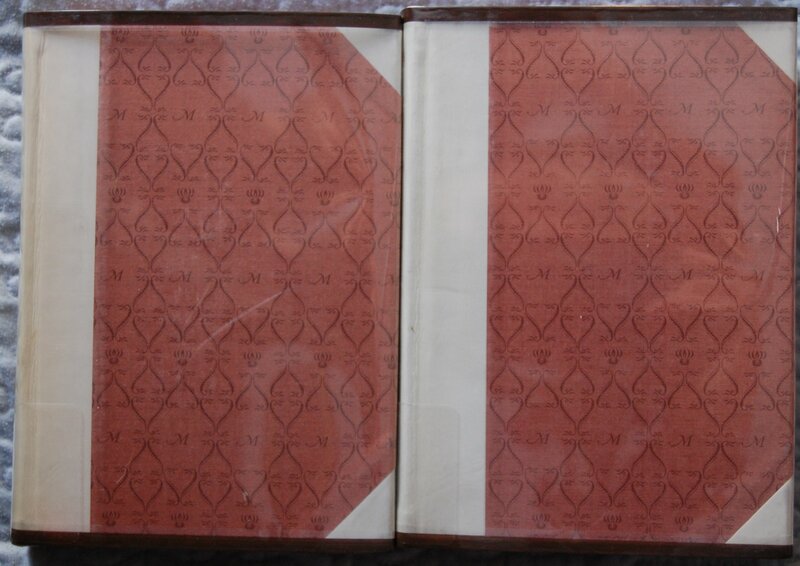 I picked up the Heritage Montaigne Volume 2 for documentation on the cheap. A curious thing I noted about the George Macy editions of the work is that they didn’t commission a new translation or introduction. 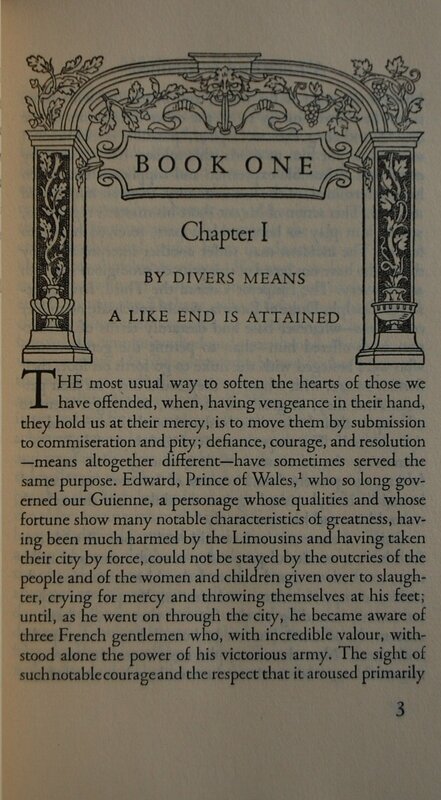 Andre Gide offers his thoughts on Montaigne, but this first appeared in 1939 by Longmans Green and Co. Ives’ translation is from Harvard University Press, printed in 1925. While this isn’t completely unusual, it’s a little odd that they didn’t recruit somebody to do either of those tasks. 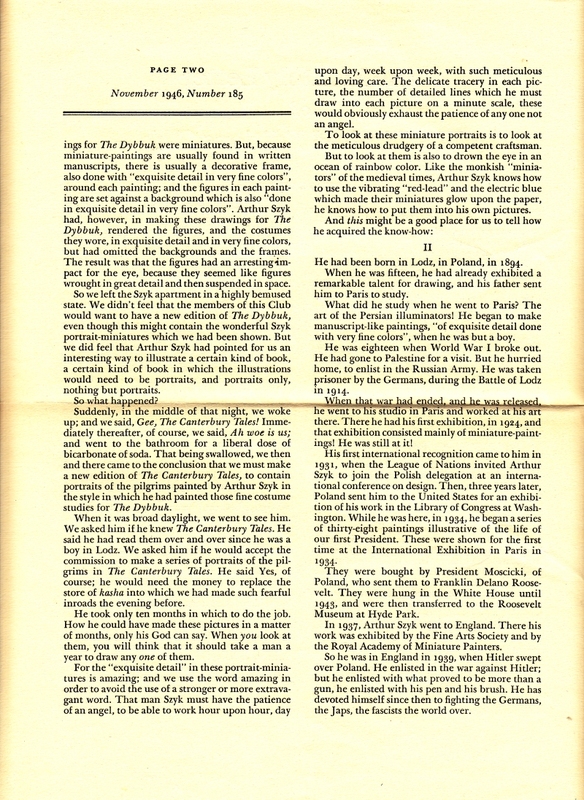 The LEC edition was printed by The Aldus Printers. 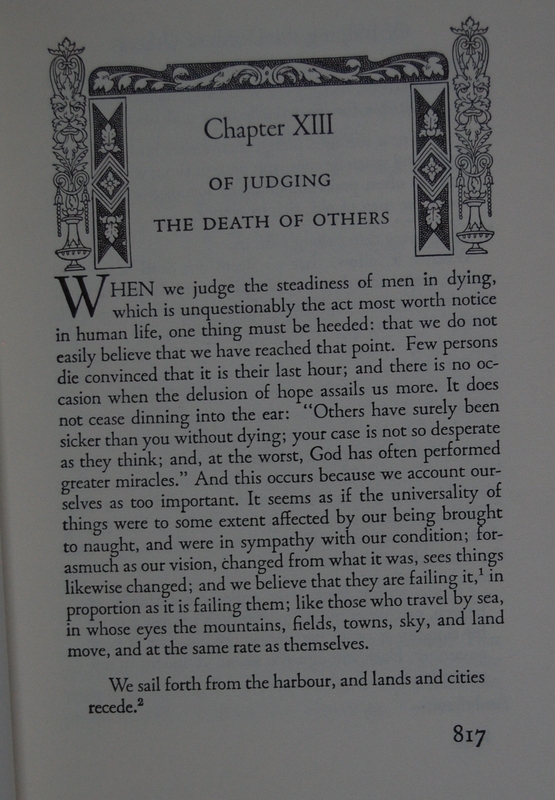 Title Page – Furthering my belief that Cleland was a master at title pages. Lovely stuff. I am under the impression Grace Norton’s contributions are unique to this edition, but I have no proof of that. Drastically different lighting I had on these, I must say. 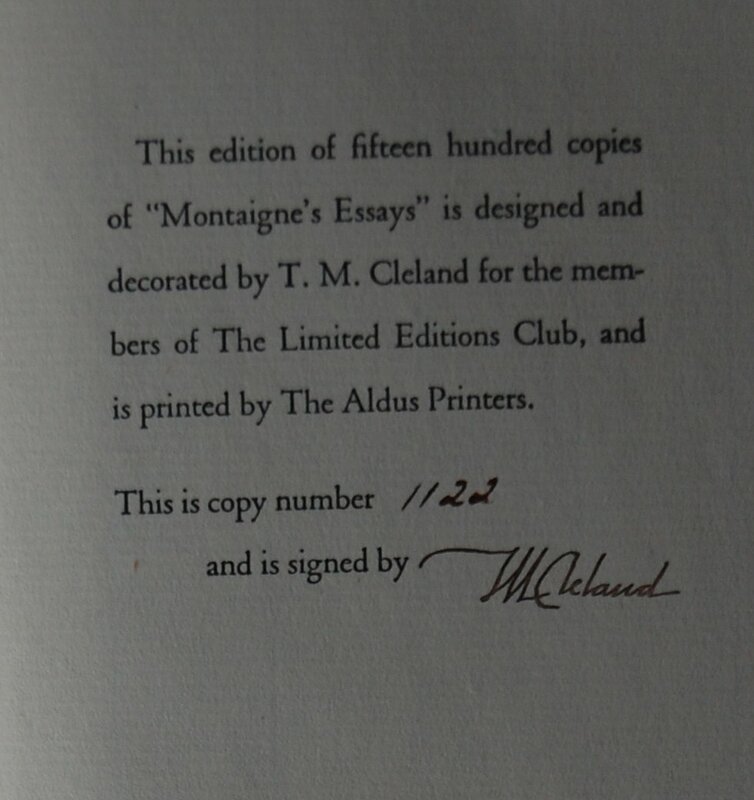 Signature Page – This is number 1122, and Cleland provides his nom de plume. Page 3 (LEC) – The chapter heads have pretty decorations at the head of each, and I’ve provided two examples of this for each edition. There are no further illustrations. Personal Notes – Picked up for a song at a library book sale, although part of that reason is that it’s a poor library copy. 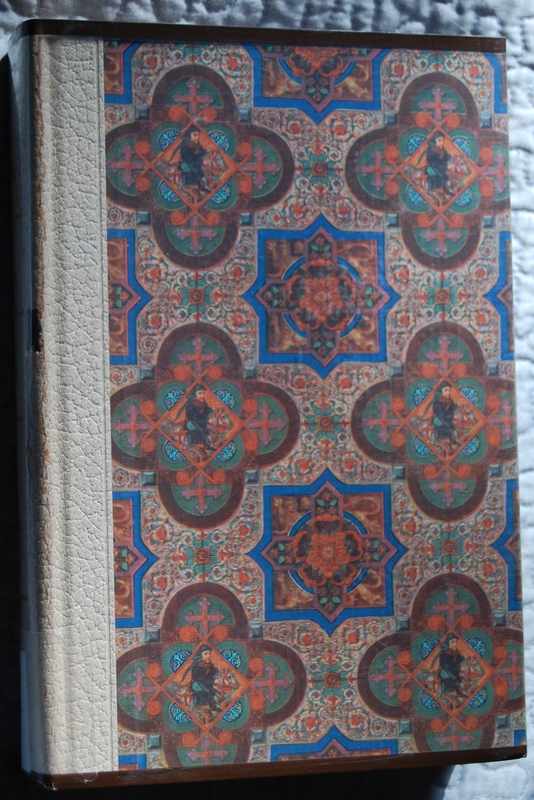 The book itself is in good condition, but it’s full of writing and stamps. :( I’ll be selling it off soon. The LEC version was checked out from my university. 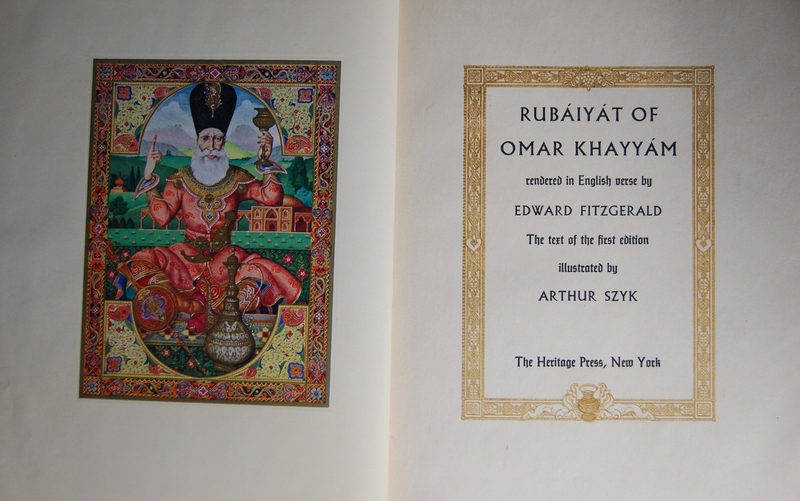 Front Binding – In 1940 the Heritage Press put out a lovely exclusive – The Rubaiyat of Omar Khayyam, utilizing the talents of Arthur Szyk to illustrate the volume. 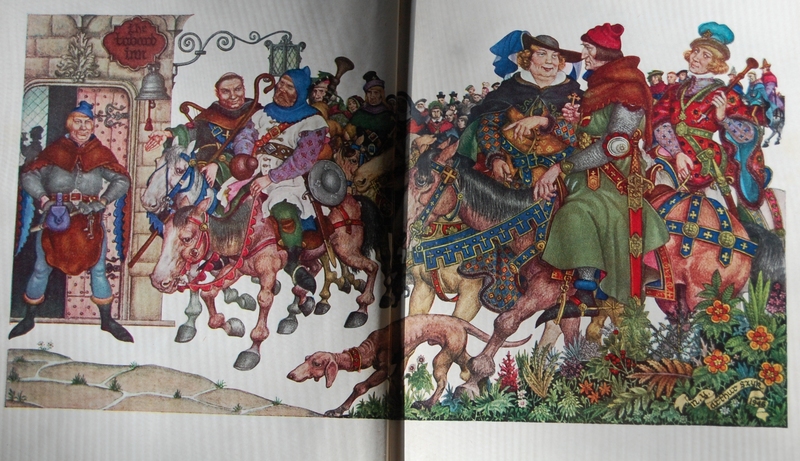 This edition had Szyk’s work mounted directly to the pages, which sounds lovely. 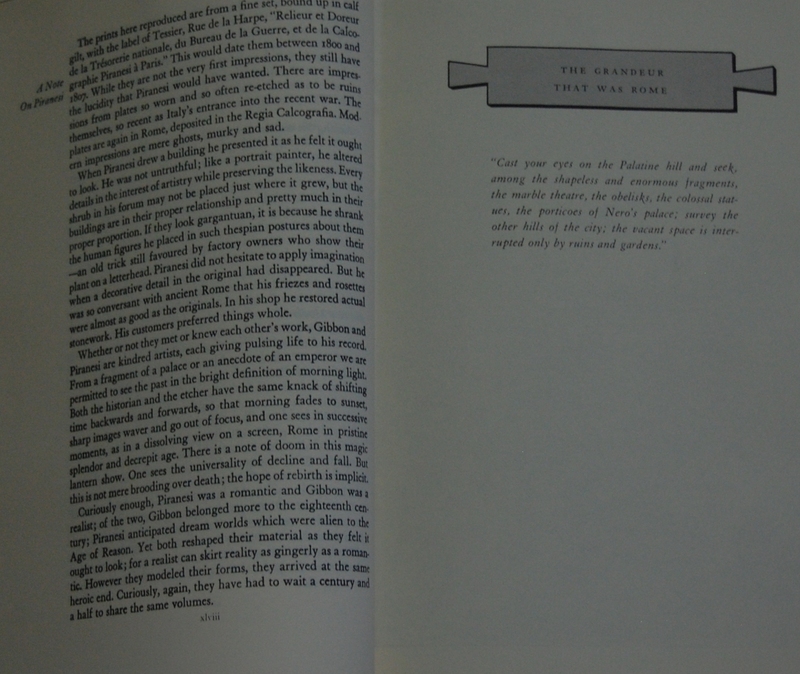 This is the later 1946 edition, which merely reprints the art onto the page. Still, this is a lovely book. 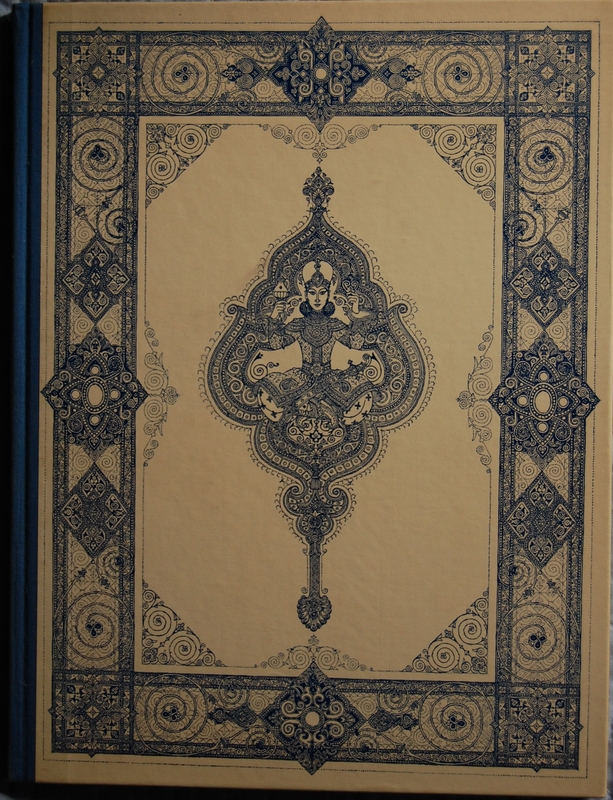 The book was designed by Ernest Inghan at Fanfare Press in London, England, and looks very classy with Szyk’s linework printed in blue on the off-white boards. An eye-catcher, this one. Title Page –Szyk drew his work in color and gold, which Sun Engraving of London engraved. Apparently they did the same in the 1940 original. 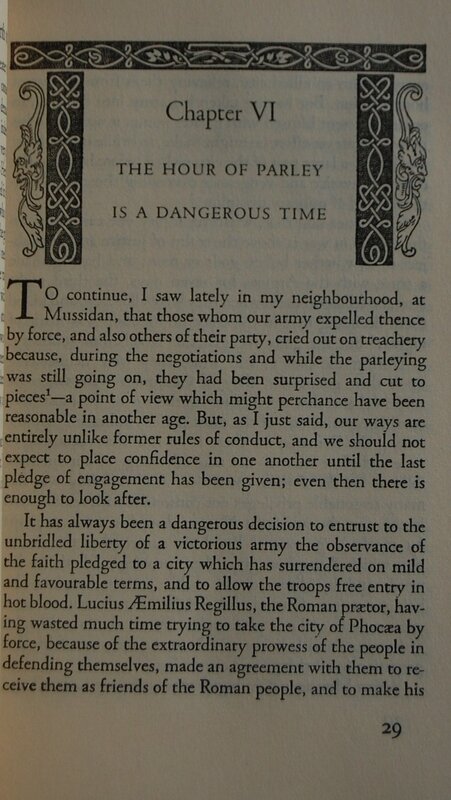 The text is Monotype Sachsenwald with Albertus Capitals, set by Mr. Ingham. 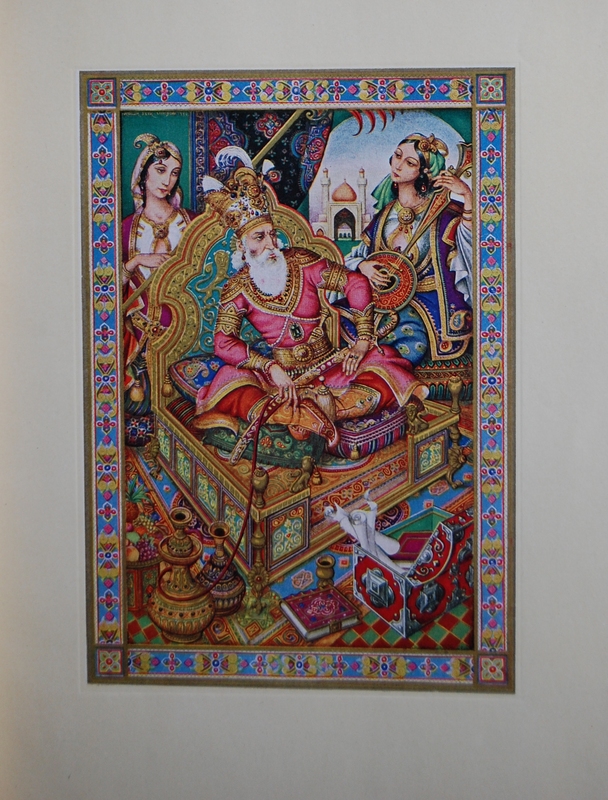 Szyk is stunning as par the course – he did The Canterbury Tales (1946), The Book of Job, The Book of Ruth, The Story of Joseph and his Brothers (in the 1948 Evergreen Tales), The and The Arabian Nights Entertainments for the LEC, along with this and Ink and Blood (a very rare collection of his own work) for the Heritage Press. The translation is the wildly popular Edward Fitzgerald one that seemingly was everywhere in this era – I’ve seen a Random House edition that was rather nice using the same Fitzgerald translation, for example. Page 2 – Stunning stuff. Personal Notes – One of my more recent acquisitions, received on my last day of volunteering at my current employment. It did come with a gold slipcase, but it was very ratty and split nearly in two – I didn’t really think it was necessary to keep it in such poor condition. Glad to have a Szyk book at last! I’m lacking some crucial stuff on this one – a Sandglass and any info within (and its number), comparisons to the 1940 printing, and other insights would be ideal. Please let me know through the comments here or at my thread about this blog at the George Macy Devotees @ LibraryThing! Thanks! 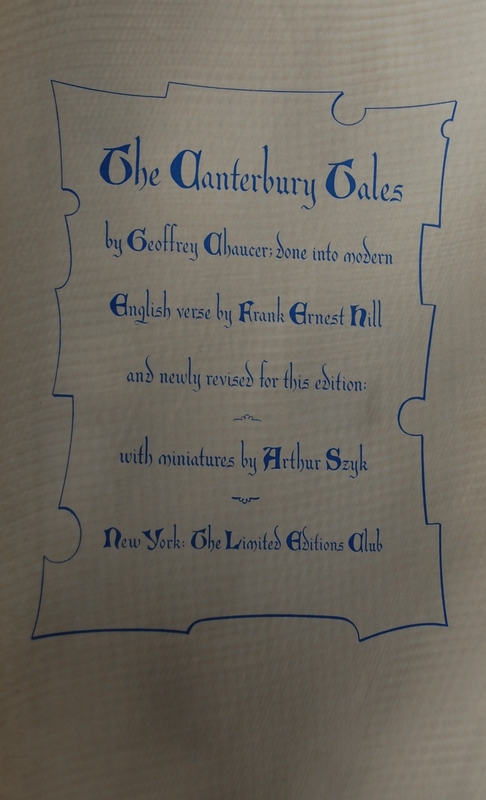 Translated by Frank Ernest Hill, who revised his earlier translation for the LEC in 1934 for this edition. Hill also provides an Introduction. 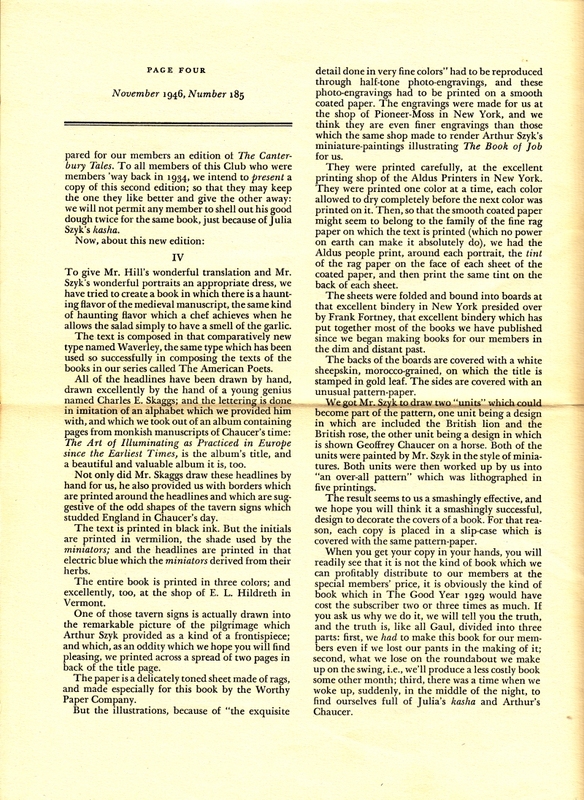 Note – This is a special post, as I get to compare the Limited Editions Club original to the Heritage Press reprint. I’ve taken shots of both books on the same pages and topics, and will put the LEC shots on the top and the Heritage ones on the bottom to make it easy to look at both. This will be a continuing feature that will continue to occur as I manage to procure the LEC and Heritage copies of books to document. 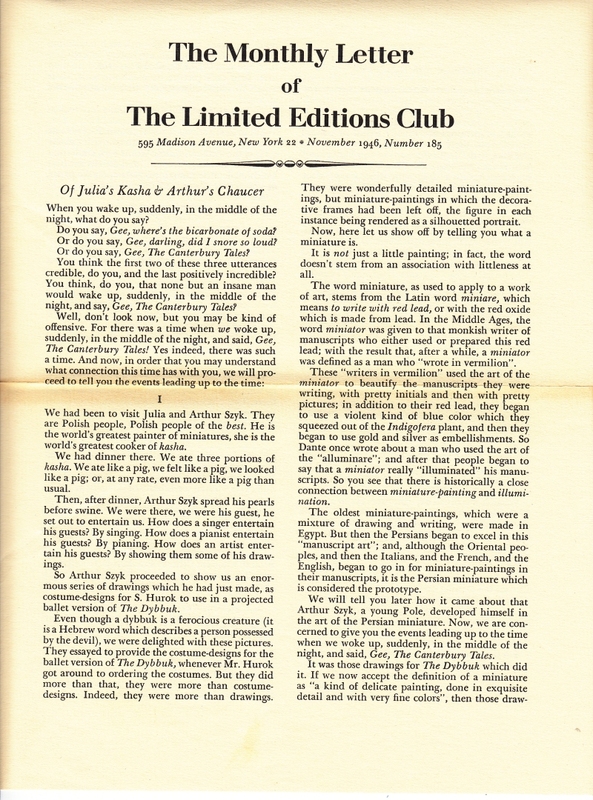 Also, I have been fortunate enough to be gifted a Limited Editions Club newsletter with my LEC copy, which I have scanned and provided below underneath the book’s images. I may do this with my own books in the future, but considering how hard these things are to find, and I stumbled on one at a library, I felt compelled to share this particular one with you. If it goes over well, I’ll definitely ponder putting up mine. Enjoy! 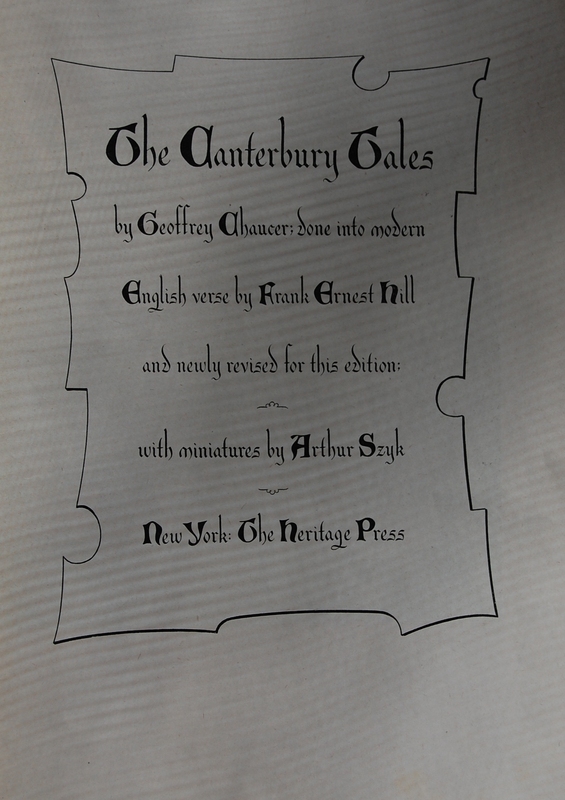 Title Page – The LEC edition went with a nice blue ink for its title page, while the Heritage ran with standard black. Otherwise, they’re about the same. 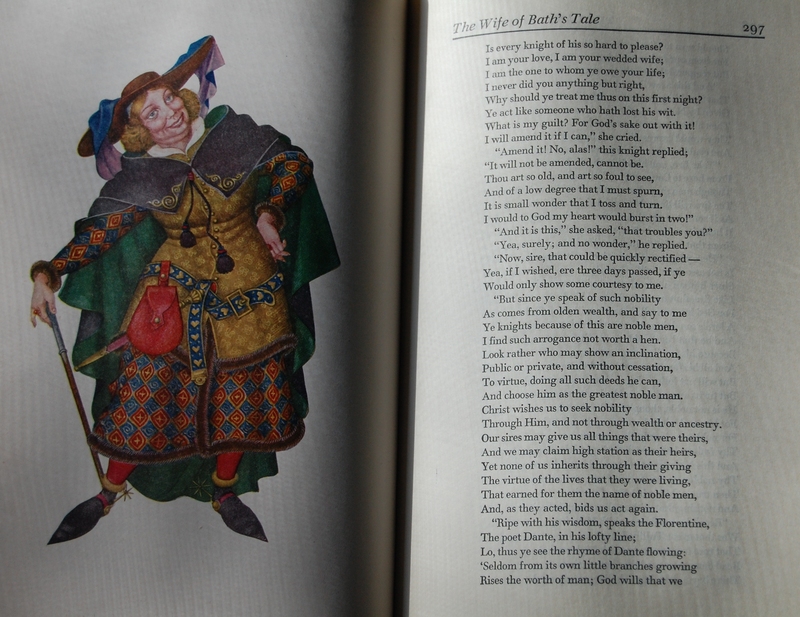 Introduction – The LEC continues to spice up its pages with color – blue and red are used throughout the text, while the Heritage reprint sticks it out with their black. The LEC also has the added bonus of “feeling” the text with your hands (and by that, I mean that the ink rises above the page slightly, and you can notice the difference brushing the page with your hand), which is just incredible. Signature Page – Oh, how I wish you were mine. Alas, it is UC Merced’s, and is #1122 of 1500. Szyk has a very nice signature, I must say. 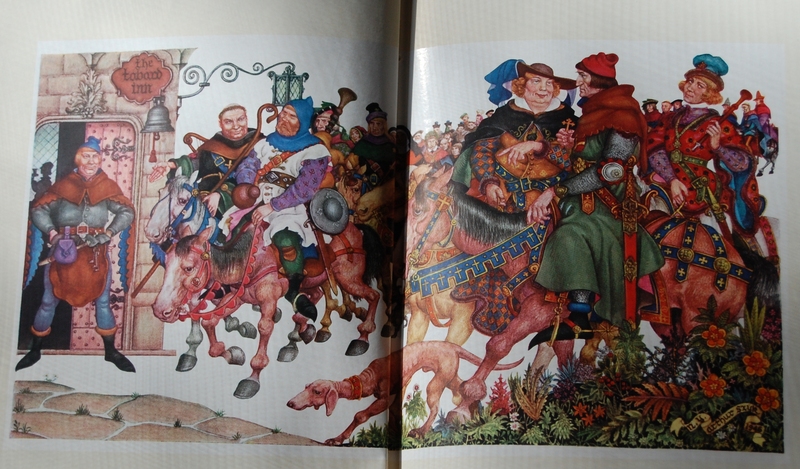 Title Illustration – Flip the title page and you’ll see this decadent piece that Szyk did of the entire cast of the Canterbury Tales. The LEC original is much more vibrant with its colors and detail, which isn’t much of a surprise. It’s a bit hard to tell in these shots, but the LEC artwork has a nice border around it that’s a light tannish color, and the text on the right or left of the portrait shares that attribute, as you’ll see below. You are currently browsing entries tagged with 1946 at The George Macy Imagery.